Related: Tool deletes Microsoft piracy alarm. Two Washington state businesses and three Seattle residents have filed a second lawsuit against Microsoft over its Windows Genuine Advantage program. The suit alleges that legitimate customers are receiving non-licnesed notifications every hour, and seeks class-aciton status. According to a copy of the court filing published by the Seattle PI, the plaintiffs argue that all customers who have Automatic Updates enabled will receive WGA whether they wish to or not. In addition, the lawsuit claims that end-users are deceived into thinking the software is a security update and "are not told that the program ‘phones home’ daily." The first lawsuit — filed in California last week — made similar complaints, alleging that Microsoft’s WGA functionality violated the state’s anti-spyware statutes, as well as laws in Washington. Also seeking class-action status, that case does not ask for monetary damages, only an injunction to prevent the use of the phone home feature in future WGA releases. WGA Notifications , the component responsible for connecting to Microsoft’s servers each day to check for a configuration file, was officially rolled out worldwide last week. The final release removed the daily check, but WGA will still communicate with Microsoft periodically. When asked how often customers’ computers will connect to Microsoft, the company told BetaNews, "The frequency varies depending upon license type, but typically takes place every 90 days or so. This enables Microsoft to update our list of bad keys, and ensure that newly discovered counterfeits are not proliferating." The second lawsuit against WGA goes further than the first, demanding that Microsoft provide an automatic update to remove WGA and enable users to download any updates without having the program installed. As of July 2005, customers that do not pass WGA certification may not download non-critical updates and many programs from the Microsoft Download Center. In addition, the filing asks that Microsoft work with security vendors to enable the removal of WGA using antivirus applications. It also says Microsoft should waive any claim it has under the Digital Millennium Copyright Act regarding individuals that investigate or remove WGA. Compensation for consumers who have been harmed by WGA, and attorney’s fees are additionally requested. For its part, Microsoft has said that users can choose not to install the new version of WGA Notifications. The company is also providing instructions on how to remove the previous version of the software for those who do not want to upgrade to the official release. Microsoft says it continues to modify WGA based on customer feedback, noting that the tool plays a critical role in stopping piracy of Windows, and protects customers from counterfeit versions of the operating system that may not be secure. 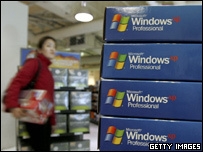 An anti-piracy check for Microsoft Windows is causing problems for some users who are being told their copies of operating system XP are not genuine. The tool, called Windows Genuine Advantage (WGA), is aimed at cracking down on millions of illegal copies of Windows XP in circulation. The tool is downloaded and installed voluntarily but Microsoft has said it could become mandatory in the future. Blogs and forums have been hit with comments and queries about the tool. The tool was downloaded as part of a wave of security updates Microsoft offered to users. If it is not installed Windows XP will periodically remind people to download and run the program. On the official Microsoft forum for WGA, thousands of people have left confused comments. One person posted: “I have a Microsoft sticker on the back of the computer with 25 characters. Readers of the BBC News website have also reported their computers being forced to dial up to the net with their modems everytime they re-boot or having problems with brand new equipment. WGA requires users to enter the key code that comes with every copy of Windows XP. If the code is not genuine or has been used by someone else, users are told that they do not have a licence to use XP and are invited to buy a genuine copy at a discount price. Users with a counterfeit copy of Windows XP can continue to use their computer and will receive periodic notices that the operating system is unlicensed. Michala Alexander, head of anti-piracy for Microsoft, in the UK, said the tool had been a huge success in countering piracy. “Customers have been crying out for a tool which could tell them if they have been duped,” she said. But she admitted that the company could have been a bit more “open and honest” about the pilot tool when it was launched. Ms Alexander said Microsoft had listened to users and updated WGA accordingly. According to Microsoft 15% of operating systems checked so far have proved to be counterfeit in the UK. Microsoft has said it will not deny users access to their computer if the key code is not correct and has reassured people that it does not use the tool to collect personal data. But some people have complained of glitches with the WGA tool that means they are being told erroneously they are using a counterfeit copy of XP. In its information for users Microsoft says that “validation failure is almost always caused by the use of a non-genuine Windows licence”. Microsoft says it has successfully validated more than 150 million systems. Ms Alexander said many of the problems stemmed from XP being installed incorrectly or if a machine had been sent for a repair and a new version of XP was installed with a generic key code. “We are 100% adamant that key codes blocked by WGA are illegal,” she said. Microsoft has also admitted that the tool can cause false positives and that a pass on the system initially could lead to a failure. Once installed the tool checks the copy of Windows XP periodically. 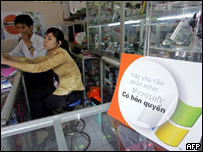 Microsoft is determined to crack down on piracy before it releases its next operating system, called Vista, in January. As the debate over Windows Genuine Advantage rages on, Microsoft is attempting to rein in speculation that the antipiracy tool could be used put an abrupt end to the use of pirated versions of Windows. A spokesperson for the company firmly denied that the tool would be used in such a manner, saying that “No, Microsoft antipiracy technologies cannot and will not turn off your computer.” Confusion remains over just what WGA is designed to do. Dislike for WGA and what it represents has been brewing for years, stemming back to the release days of Windows XP. At that time, Microsoft required new copies of the Windows XP operating system to “activate” over the Internet using Windows Product Activation (WPA), a process that required a user’s consent to send identifying information about their computer and OS to the company. While that information was essentially nothing more than an authenticity code coupled with select system specifications, many users were uncomfortable with the tactic. Still, it was much like a tetanus shot: one quick prick click, and it was over. Piracy, of course, lived on, and WPA has largely been assessed as a victory only to the extent that it stopped many forms of casual piracy. With Windows Genuine Advantage, Microsoft is looking to improve on the anti-piracy tools of 2001, and WGA is best understood as the heir to WPA. Whereas the original tools only required activation once in the first 30 days of use, WGA is designed to constantly monitor a system’s licensed state. In very general terms, the idea is to make life as a so-called pirate difficult.